Aurora dedicates a creation to the American continent, celebrating its melting pot of cultures, people and adventures. Endless landscapes, the legend of the frontier and the emotion of conquest. A land that, once again is just waiting to be rediscovered. Lonely landscapes and modern cities. A journey that continues among g the symbols narrated by the details of the special ring: from the Indians, the first inhabitants of these lands, to the pioneers wagon, the cactus of the desert and the condor drawn by the mysterious Nazca Lines. 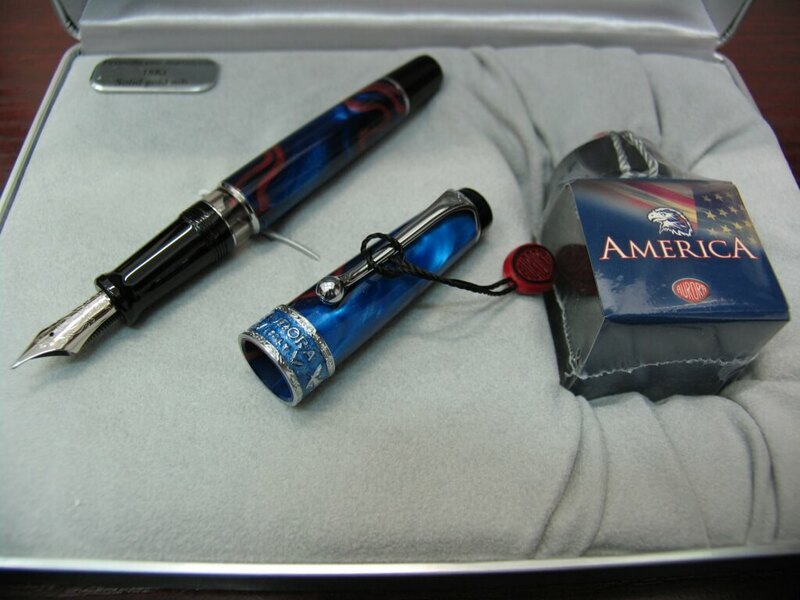 The cap and barrel of the pen incorporates the color of the american flag. White like purity and innocence, Blue like vigilance, perseverance and justice, Red like valor and courage. The stone “Red Jasper” on the head irradiates the marbled resin body with a red glow. The clip is embellished with the engraved map of the continent. Fine details decorates the ring and narrate the legend of the American continent. The fountain pen is made more precious by the refined 18 Kt. solid gold nib.